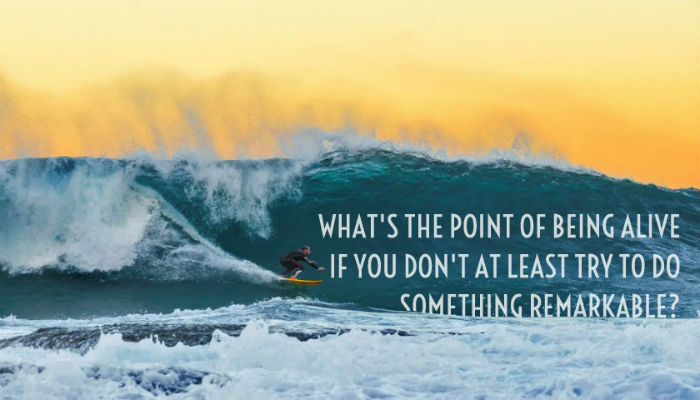 We love the surfer scene of these business ecards because it is everything that many of us wish we could be - adventurous! A lot of the time we're guilty for wishing we could go out there and grab new opportunities and try new experiences. We loved this scene because it gives the impression of just going out there, trying something and not worrying too much about the consequences. When someone is surfing they don't know what wave is coming next so they just have to get out there and grab it which is the whole idea behind this ecard. As is tradition for Eco2 Greetings e cards we wanted a quote to go alongside this breathtaking scene and we chose this one. To use the whole scene symoblises something pretty remarkable and what you can achieve if you just try to grab something new and so the quote seemed like the perfect fit alongside it. We wanted the text to be clear and not take away from the actual photo and so we chose a text that could fit in with the blue of the sea, which we think fits pretty perfectly. Want something else? Browse our range of ecards until you find something perfect! We would love you to bookmark our main website because when Christmas time comes we are the only place to stop for holiday ecards for business.